A new collection of Velvet Orchid was released yesterday. Like in the previous collections there is a lot of black, pink and purple. I'm not a fan of Velvet Orchid, and I rarely find something I like. 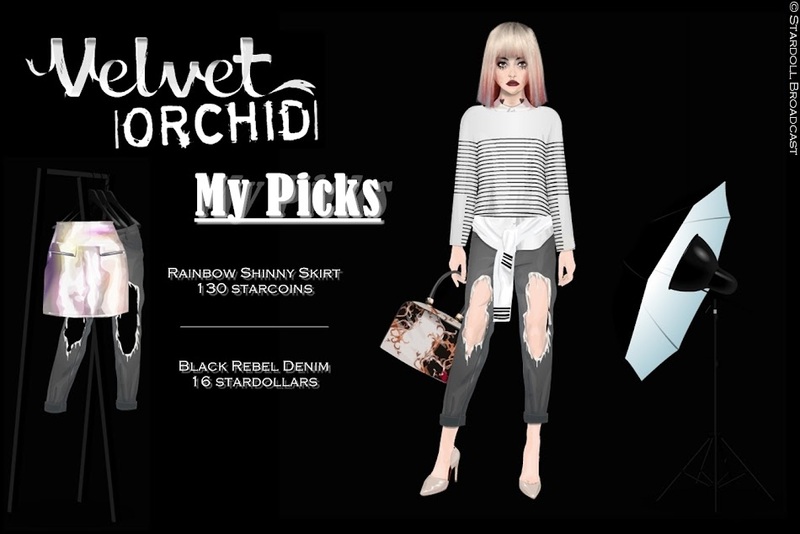 In this collection I picked out two pieces, the "Rainbow Shinny Skirt" and the "Black Rebel Denim". The skirt is the highlight of the collection, not only because it's iridescent, which is one of the hottest trends at the moment, but also because of it's price (starcoins!). As for the jeans, I don't usually buy denim, but these strongly remind me of the "NY Used Denim" from the Young Hollywood Street Style collection (here) which unfortunately I missed. They are rolled up, ripped and loose and I love them! Love the dress, the sparkly heels, and the corset top. Will have to see about the others. Certainly better than the month of May's HBs. It is very difficult to see the items due to the Velvet Orchid background. I like the shiny skirt, too.